Abbott: Hey, Costello. Have you heard about the giant cow heads in Detroit used to advertise Wilson’s Dairy? Costello: It’s not a herd. It’s only two. And two cows don’t make a herd. Abbott: I didn’t say it was a herd of cows. I asked if you’ve heard about the two giant cow heads. Costello: Of course I have. But I still say two cows don’t make a herd. Abbott: OK, lets make this simple. There are two giant cow heads that are used to advertise Wilson’s Dairy. Costello: So if they’re just the heads, how do they give milk? Abbott: They don’t have to give milk. They are icons. Costello: Icons? I thought they were Holsteins. It’s true! Detroit was once home to not one, but two giant cow heads. The Bovine billboards were a unique advertising gimmick designed to help promote Ira Wilson & Sons Dairy. For twenty five years one cow stood guard on the west side of Detroit, the other still watches over a decaying east side Detroit neighborhood. 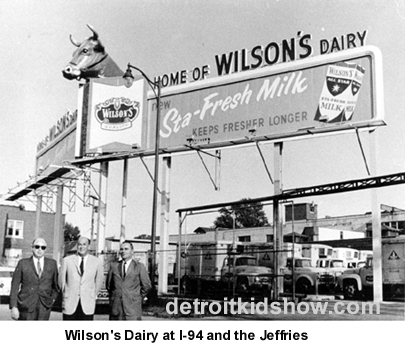 The west side cow was mounted above the main entrance of the Ira Wilson & Sons Dairy, a huge complex located on the I-94 service drive at the Jeffries Freeway. The dairy was founded in 1930 and soon became one of the top three milk producers in southeast Michigan. The 14-foot tall plastic cow head was installed in the late 1950s and was a favorite landmark for a couple of generations of Detroit children. In 1983 Ernest W. Sharpe, chairman of the board of Wilson Dairy, decided to have the iconic landmark removed. The weathered cow had never been repaired or maintained since its installation and was in bad shape. Over the years the cow suffered major structural damage, including a rusted out steel support frame and dozens of bullet holes. Sharpe’s plan was to store the cow head in a warehouse until repairs could be made, then reinstall it at a different location. Ira Wilson Dairy was ultimately sold to Melody Farms, who closed the I-94 dairy complex. The building is now used by the Detroit Police Department as an impound lot. The whereabouts of the cow head are unknown. In the late 1920s the corner of Mack and Lenox in Detroit was home to a Puritan Oil filling station. Wilson purchased the property in 1955 to build a dairy store. This was their third store on Mack Avenue; the other two were in the Grosse Pointes. The Wilson Dairy Stores offered ice cream, baked goods and candy. The Mack and Lenox location was the only one with a cow head on the roof. Wilson closed the Mack and Lenox store in the early 1960s. It reopened as Dairy Ann, and served soft serve ice cream until the early 1980s. It reopened briefly as the C & P Ice Cream Bar, then a take-out barbecue joint, but the building has been closed for more than thirty years. The cow head had its fifteen minutes of fame when it appeared in the 2002 Eminem film 8 Mile. The film’s producers pried the plywood off the long abandoned ice cream store’s windows and gave both the building and the cow a fresh coat of paint. In the film, Eminem’s character and his posse drive in front of the building and shoot the giant cow between the eyes with a pink paintball. The owner of the building at the time didn’t want his cow defaced, so the paintball splat was created with computer graphics. Almost fifteen years after 8 Mile’s debut, the area clearly has seen much better days. The once bustling neighborhood has transformed into a surreal urban prairie, probably the only urban prairie with a giant cow head. 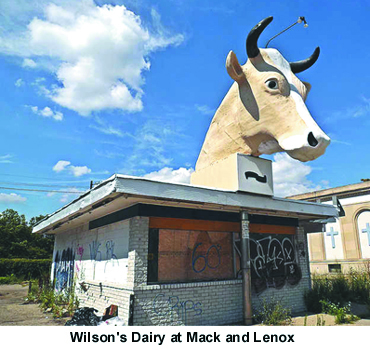 The remaining buildings, including the old Wilson’s Dairy store, have been tagged by graffiti vandals, but the cow head remains untouched and in remarkably good shape. Maybe because it’s an icon of rap history, or maybe because it’s an icon of the neighborhood, it’s clear that the people in the area respect the cow.